This week I’m very happy to share with you the contribution of the first of our guest bloggers, Andrew S. Gallan, PhD. Assistant Professor, Department of Marketing, Driehuas College of Business, DePaul University, Chicago and faculty research fellow at the Center for Services Leadership at Arizona State , who discusses the use of the Net Promoter Score (NPS) in healthcare. Net Promoter Score (NPS) is a valuable metric, and it has no doubt been adopted by many companies and industries. NPS is a simple, easy to use, and easily calculated metric that is intuitively associated with business health (Reichheld, Fredrick F. (2003), “The One Number You Need to Grow,” Harvard Business Review, 81 (December), 46-54). Health care organizations are beginning to see its value, and are debating how it is best used (for a discussion, see http://www.linkedin.com/groupItem?view=&type=member&gid=1912473&item=167418244&commentID=102337101&trk=eml-anet_dig-b_pd-pmr-cn&ut=3z8Ty_z5VcWRs1). 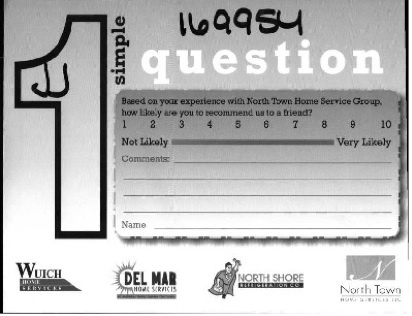 NPS is calculated by asking your customers one question: “How likely is it that you would recommend [your company] to a friend or colleague?” The responses are scored on a zero to ten (11 point) scale, and customers are categorized as promoters (those you responded with a 9 or 10), passives (7 or 8), or detractors (0 to 6). 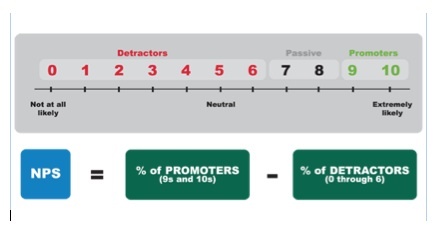 NPS is then computed by subtracting the percent of detractors from the percent of promoters. An easy schematic representing NPS is below. NPS has been shown, in several industries, to be a less-than-perfect metric that is inferior to customer satisfaction in predicting future business performance (see Morgan, Neil A. and Lopo Rego (2006), “The Value of Different Customer Satisfaction and Loyalty Metrics in Predicting Business Performance,” Marketing Science, 25 (5), 426-439; and, Keiningham, Timothy L., Bruce Cooil, Tor Wallin Andreassen and Lerzan Aksoy (2007), “A Longitudinal Examination of Net Promoter and Firm Revenue Growth,” Journal of Marketing, 71 (3), 39-51.) Nonetheless, while academics debate whether NPS is the best metric, it continues to be widely used by organizations across many industries. The use of NPS in health care has some potential drawbacks of which you should be aware. Several conditions in healthcare suggest that there is, at best, a weak correlation between stated intent and actual behavior. If you are looking for repeat business or actual word-of-mouth, behavioral metrics of loyalty, you must consider that there are often long inter-purchase times in health care. That is, patients go long periods of time between health care encounters. This context allows time (and other mediators and moderators such as recurrences, other life events, and disability) to intervene between a [fading] memory and actual behavior. Discovering a patient’s INTENT does not always translate into BEHAVIOR. Who is receiving the survey? Can you reliably reach the actual patient for the response, or are you capturing the often distorted or uninformed perspective of another individual? Certainly DRG/health condition is a variable of which you should be cognizant, as certain disease states offer higher reliability and shorter inter-purchase times. For instance, stroke patients may not have the ability to answer the question reliably, while an otherwise healthy patient discharged with a cast for a bone fracture in their leg is better able to provide an informative view of your organization. Regarding interpurchase time, some patients need to return frequently for health care while others are happy NOT to return in the near future. Is the patient highly aware of what is being done, and do they have the expertise to recognize quality care (broadly defined)? Does the patient have the opportunity in between visits to discuss health care providers and experiences, or do they avoid these discussions? As an example, elderly patients in a peer community such as independent or assisted living have greater opportunity and incentive to discuss these matters, while relatively healthy younger adults have fewer opportunities and encounter incentives NOT to discuss such matters. The bottom line is that the expertise, experience, and circumstances of the patient really matters. What this all suggests is that, to the disappointment of many who would love to collect only one question, it is best to collect multiple measures, including but not limited to NPS, satisfaction (ask specifically about satisfaction or being pleased), intent to return, intent to engage in positive word of mouth (WOM), and other relevant measures. There is no “magic question” that distills a rather complex set of circumstances, perceptions, intentions, and behaviors into a one-line diagnostic. Much like the processes that arrive at a diagnosis in medicine, the health care manager must also look at multiple indicators of healthy customers. Good luck! About the time that Reichheld was developing the NPS, I developed a different question – the advocacy scale. Rather than recommendation this focuses on the propensity to talk up or talk down a particular organisation. It has many advantages over the NPS. For example, using a balanced positive/negative scale with a midpoint, it overcomes the arbitrary and quite unjustifiable ascription of a positive rating to scores of 9 and 10 and a negative rating to those giving a 0 to 6 score. Recommendation as a concept is problematical in health, as in many other areas because of the problem of being asked if you would recommend something that may well not be relevant to your friends or colleagues. The advocacy scale question is also one that, almost uniquely, can be used across all stakeholder groups – employees, investors, regulators, opinion leaders, as well as customers and potential customers.